Find anything anytime at free! 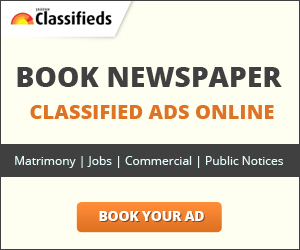 With Jagran Classifieds you can search for all sorts of services including wedding planners, packers and movers, travel agencies, marriage bureaus and lots more. You can easily find free advertisements for all your need and also post free ads. "TIME FOR TAX SAVING INVESTMENTS IN LIC, SAVE YOUR TAX TODAY"
Do U have a Life Insurance Policy? Its just a parameter how much you care. New GST registration for entities that do not have VAT or service tax registration @5000/- with one month consultancy fees. GST migration for entities with existing VAT or service tax registration @3000/- with one month consultancy fees.